Trust the process. If I learned anything writing The Pagoda Tree, it is that. Except, like with any lessons, it’s easy to forget. Over the past three weeks I’ve written about the fun stuff: planning, dreaming and researching a novel. The actual writing is much thornier. From the start I knew I needed to get the scenes down, however rough. Louis de Bernieres confirmed that approach after telling me how bogged down he became researching his epic Birds without Wings. If you research first and write later there’s a danger of getting lost in the morass of reading and sinking into your sources without trace. For sure, you need to know enough about your world to get your characters moving. But it’s easy to get caught up in the details. Early on I couldn’t find out what transport they used in 1770s Madras. Was it a hackney carriage or a palanquin? After spending several hours trawling through my notes and online I realised it didn’t matter at that point in the writing process. What mattered was advancing the story. Although I found generating the material hard, really hard sometimes, my focus remained on completing a first draft. I think of a first draft as a lump of raw clay. You go down to the river and scoop up this messy, formless mixture. It spills over the bucket and has a mind of its own. But if you don’t have the clay you can’t mould your pot. You can’t imagine what shape it will look like or what glaze will make it shine in the final design. I’m no stranger to what former editor at the Good Weekend magazine, Fenella Souter, describes as the ‘slough of despond’. That midpoint when you can’t figure a way through, when it seems the story will never become coherent. For a feature article it may last a few days or a few weeks, rarely longer. A book requires something else. I found the writing software Scrivener invaluable at compiling everything in one project. It also gave me my total word count. A year into writing and my research, character sketches and scenes totalled 100,000 words. Panic set in. I wondered if I’d ever find a way through. When I was writing Last Seen in Lhasa I wrote out one of Ben Okri’s quotes and stuck it on my wall. ‘A true story-teller suffers the chaos and the madness, the nightmare – resolves it all, sees clearly, and guides you surely through the fragmentation and shifting world.’ As that was non-fiction and based around my seven journeys to Tibet, the story had limits. A novel is a much bigger beast. I thought if I gave myself a brief and wrote to that, the structure would become clear. I wanted to be able to tick things off my to-do list. Yet my goal posts kept shifting. I think structure is the hardest aspect to get right and as a writing tutor, the hardest to teach. Chronology and compressing time can help, so can devices like using the seasons. In historical fiction, facts can be useful in anchoring your characters. They can also become shackles if you rely on them. During this time I deconstructed many novels, analysing them scene by scene. I read some books on craft and found James Wood’s How fiction works illuminating. On some days it seemed to help. Other days, when I sat down at my desk it was like being blindfolded in a house with many corridors and rooms, stairs up, down and sideways. I felt overwhelmed, unable to do anything. Initially I didn’t want to plan too much and adopted the ‘writing into the void’ technique. This scattergun approach frees up the writing and encourages imaginative play. I thought if I made plans or wrote a synopsis I’d lose the magic. What magic you ask? When your characters appear to move themselves across the page. Early on I had a mini-epiphany that they can’t do this in isolation of each other. It’s obvious to me now but it wasn’t back then. Conflict is a driver in plot because it puts characters in relation to each other – not necessarily against each other, although that works too – and that creates a forward momentum in the narrative. Choosing my point of view wasn’t the issue, it was juggling my cast of characters. I knew who they were and stayed with each of them long enough to get into their stride. While there were gaps I didn’t fuss about them. I thought that a time would come when I could pull my different strands together. I found rhythmic exercise helped – walking, yoga, the gym – as a way to loosen my rational mind and allow the subconscious to give me answers. I went to a weekend writing workshop with Buddhist author Joyce Kornblatt who reassured us that a novel takes many drafts. ‘It isn’t that writers are obsessive-compulsive, although they might be if they never stopped, it is because each time you do a draft you learn something new about the book,’ she said. Each time I went back over what I’d written I used my inner ‘divining rod’ to see where there was a relaxation in the narrative or a more nuanced point of view. To see where the spark, tension and energy were. I kept working with my characters and sensed there was too much competition between them. One day it dawned on me. Just as European men dominated the archival research, they were taking over my narrative. Looking back I see that I didn’t trust myself to write from the perspective of an eighteenth-century Indian woman. I felt I didn’t have permission. Then after re-reading a scene of Maya dancing, it became clear. The way forward was with my character, Maya, the young temple dancer. She was driving the scenes, not reacting. She had agency and courage. She was a force on the page. After 18 months of wrangling, I emerged from the forest blinking into the light. There was still a long way to go but I’d found path. Or a trace of one. 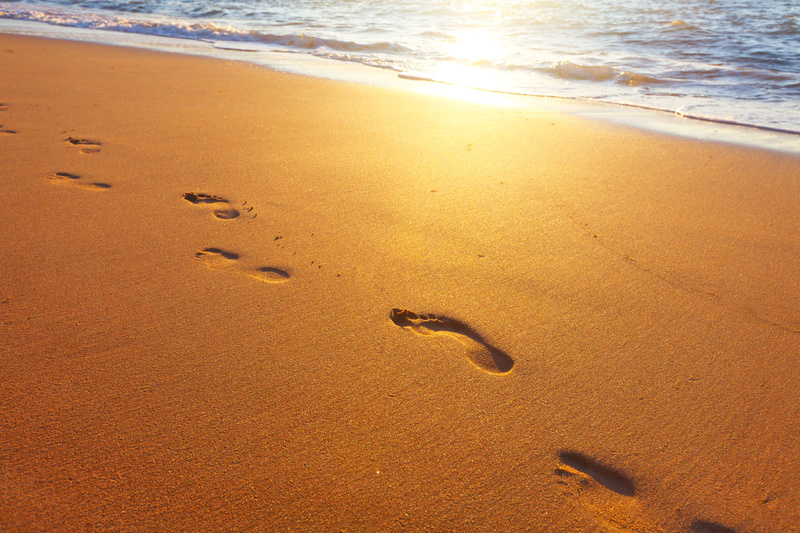 Footsteps in the sand. A way ahead. Photos were taken from Fotolia. Dancer’s hand (C) f9photos. Foorprints (C) Alexander Ozerov. Thank you, Claire – I feel much better knowing others face the same log-jams. Especially comforting, that description of becoming mired in the research data … and losing your grip on the story. I’ve had to stop writing for a few months – and more or less lost faith with the journey of my novel – until the day before yesterday I flipped open a journal and saw a couple of pages of writing about one of my characters. Detached from it by time, there she was, Therese, looking fresh and silly and full of EQ – and I thought, ‘That’s actually quite good! Wonder if I ever typed that up…” And then, reading this blog of yours, and doing some cleaning, and coming back to you … I suddenly realised that a scene for a dinner party in the middle of the book … could easily be the opening scene. That may not work … but it is the first new structural idea I have had in ages. So. Thanks, Claire. You’ve invigorated and helped.